Weight loss can be a tricky topic. Some people need to lose weight for medical reasons while others target the athletic body. While losing weight can be a struggle, the battle to keep weight off over a period of time can be more difficult. Track your weight maintenance with the Weight Guru Scale. 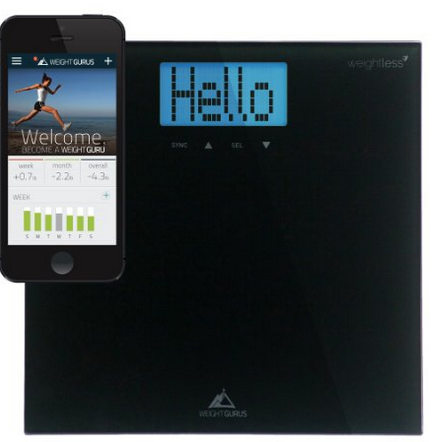 The Weight Guru Scale makes weight management convenient with smartphone technology. The Free Wieght Gurus App pp tracks progress which encourages you to reach your goal. Our Weightless feature lets you manage your weight by how much you've lost instead of how much you weigh. With Weightless you decide how to view your weight - by the number (e.g. 173.4lbs) or weightlessly by weight change (e.g. -12lbs). For the family who is trying to watch their weight, this scale is a great solution. With an auto user detect, your weight will register to you and not to your husband. The device supports up to 8 suers. The style of the scale is sleek. The tempered glass and contemporary design pairs well in a variety of bathroom styles. The Weight Guru Scale can be purchased on Amazon.com. It retails for $29.99.